Grease traps are essentially a “flow-through box” plumbed into the drain from a food preparation area. Grease trap waste is generated by commercial businesses such as fast food chains, bakeries, shopping centres, butchers and restaurants. SA Water refers to grease traps as ‘grease arrestors’ and has strict regulations surrounding them. Please refer further down the page for more information on the SA Water requirements that you need to know as a grease trap owner. How often should my grease trap be cleaned/pumped out? The size of your grease trap and the volume of waste (volume of water passing through and the volume of solids settling) that enters the grease trap will determine how frequently your grease trap needs cleaning. However, a rough guideline is to schedule your grease trap clean (often referred to as “pumping out”) for once every 13 weeks. If you are unsure of anything, please contact us and we will talk you through how often your grease trap will need cleaning. Note: All grease traps will clog up if you do not remove grease regularly! Inspections from SA Water that will be failed, likely leading to fines. 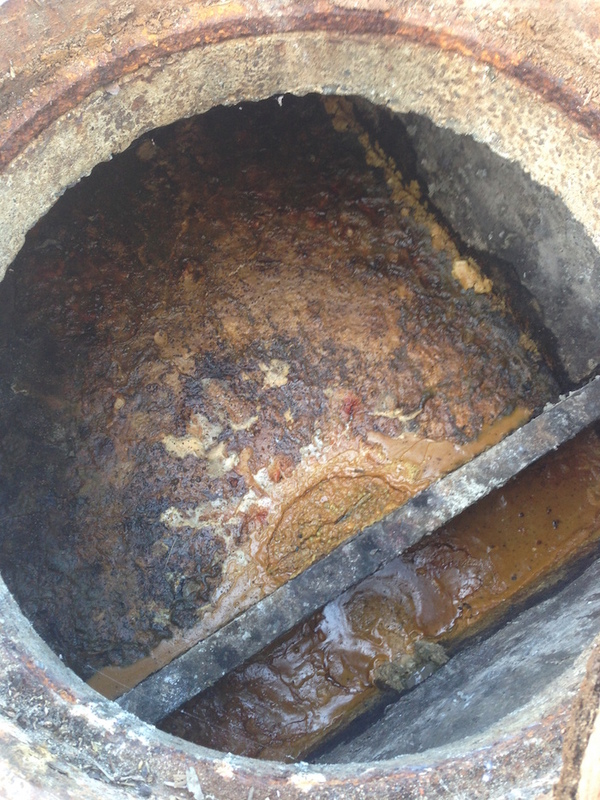 Greasy waste may enter the sewer system due to an overfull and no longer fully functioning grease trap. This can cause blockages and overflow, resulting in flooding of wastewater onto your property. If this happens in a commercial kitchen then the kitchen would be closed until the flooding has been removed and completely cleaned. At Nitschke Liquid Waste we provide cleaning and maintenance of YOUR grease trap. With our expertise, we will pump out your grease trap, scrape the sides and baffles and deodorise your system. Our service technicians also clean and inspect your grease trap filter. This service is then placed in our system as routine maintenance so that regular cleaning of your grease trap is never overlooked. For information on grease trap filters, including an outline of what is involved in replacing a grease trap filter, please see our page Grease trap filter maintenance and replacement. For grease trap sizing regulations, how to estimate the appropriate grease trap size for you, along with all other necessary grease trap information, requirements and guidelines, please read the SA Water Commercial Food Preparation and Service Trade Waste Guideline. This PDF is very comprehensive and a must read for all those who own a business that operates with a grease trap. Who can clean your grease trap? As specified by SA Water, accumulated grease trap wastes can only be removed by “a Licensed Liquid Waste Contractor of the permit holder’s choice”. Nitschke Liquid waste is a fully certified and EPA licensed company. This means we can pump out, transport, treat and dispose of all commercial, retail, hospitality, industrial and domestic liquid wastes and sludge. All liquid waste removal is documented on waste tracking forms as required by the South Australian EPA (Environmental Protection Agency). All of our services help YOU to comply with requirements as set out by SA Water. Please call us now on 8260 7660 and we will be more than happy to help YOU with your grease trap needs and enquires.